No one can claim BMW’s lineup lacks enough models. 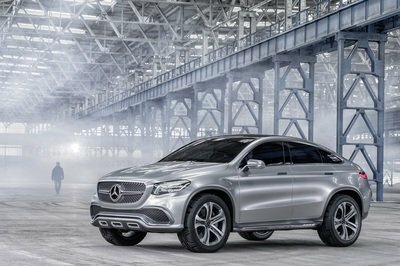 The German automaker has split more hairs when it comes to niche segments than any other brand. But one thing BMW lacks is a three-row SUV. 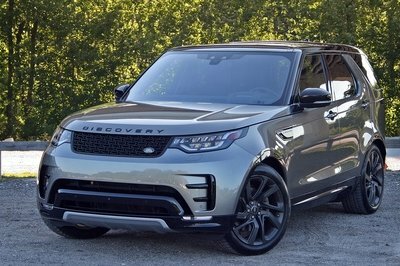 That will change when the X7 Sport Activity Vehicle begins production for the 2019 model year. In the mean time, BMW has teased the X7 with this concept version. 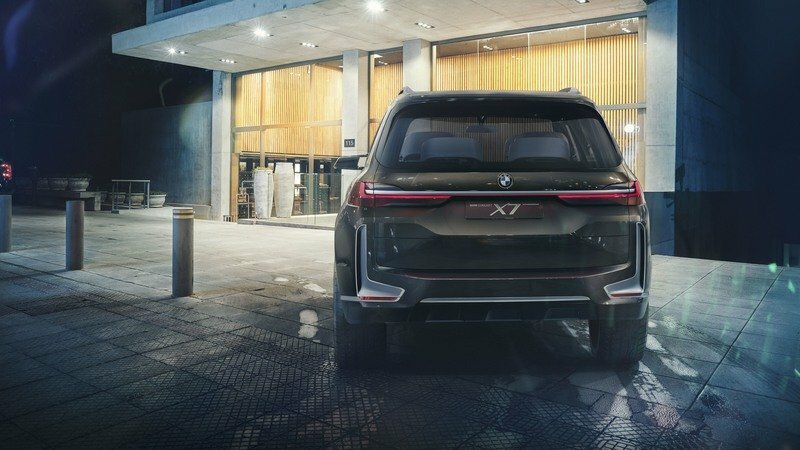 It’s (hopefully) a heavily stylized and futuristic interpretation of what the X7 will be, and comes packed with high-tech features and overstated design elements. The X7 will ride on BMW’s CLAR platform, which is currently used in the 7 Series sedan. 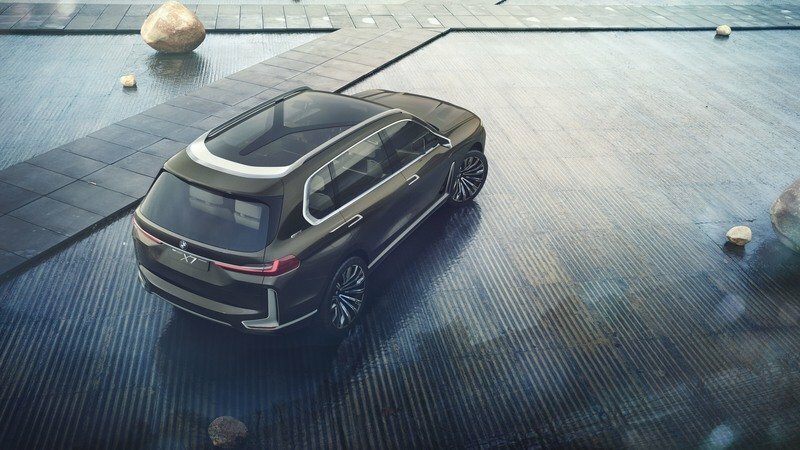 Powertrain specifications haven’t been detailed, but BMW says the X7 will offer electric propulsion, which BMW calls eDrive, paired with a TwinPower Turbo engine. Obviously, this is where the iPerformance designation comes in. The gasoline-electric hybrid system will be of the plug-in variety and can run in full EV mode with zero local emissions. We expect BMW’s inline-six and V-8 engines will be available, too, with rear-wheel driving coming as standard and all-wheel drive being optional, perhaps depending on the powertrain. So, until BMW debuts the production version of the X7, this concept remains the best guess at what we can expect. 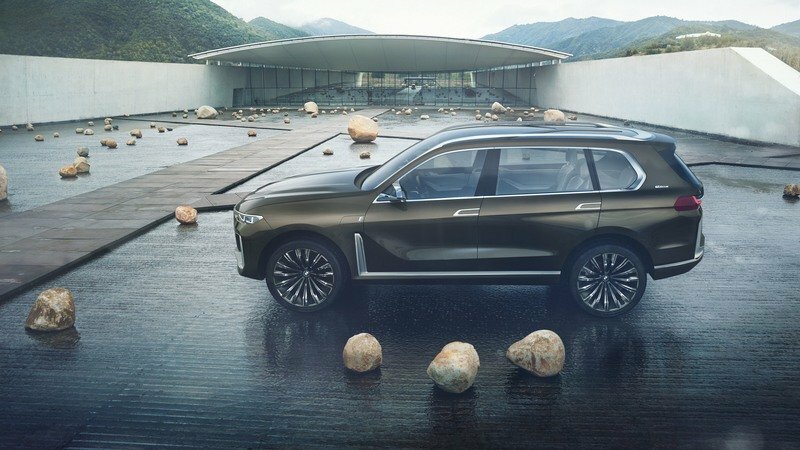 Let’s just hope the overstyled exterior gets heavily toned down before the X7 hits showrooms in late 2018. Updated 09/19/2017: We added a series of new images taken during the concept’s presentation at the 2017 Frankfurt Motor Show. Continue reading to learn more about the BMW Concept X7 iPerformance. It seems BMW is trying to carve new territory in the SUV segment. The bold, overstated design certainly calls attention to itself – though some could argue it attracts too much attention. Rather than softer lines of the X5, BMW chose to sharpen its pencil when sketching the X7. Its lines are crisp and curves are kept to a minimum. Rather than softer lines of the X5, BMW chose to sharpen its pencil when sketching the X7. 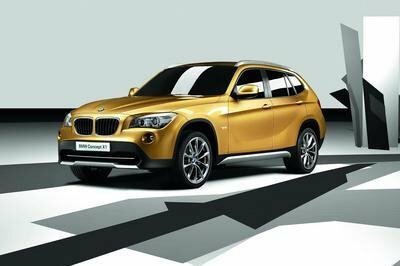 Up front, BMW has stretch is kidney grille to an overgrown size, with the single-piece grille consuming an unnaturally large amount of real estate. As large as the grille is, the headlights are proportionally small. BMW is using laser lights here, affording it the opportunity to add style behind the clear lenses. Blue-colored X-shapes references both the X Class and the iPerformance blue seen accenting vehicles like the i8 and i3. Down low, large vertical inlets send air around the wheels while adding visual height to the X7’s front profile. As with the tall front end, the X7’s rear is very vertical, foregoing the coupe-like look of many modern SUVs. Undoubtedly this helps headroom for third-row passengers. Back here, BMW uses more vertical vents to give a sense of height, while thin brake lights wrap completely around the X7’s tail. As with the tall front end, the X7’s rear is very vertical, foregoing the coupe-like look of many modern SUVs. The X7 gets tons of bright and satin chrome accents – from the front grille to the doors, and on to the D-pillars and roof. As with the X7 being so large, BMW designers added 23-inch wheels to keep the proportions in check. Count on smaller wheels on the production version. As overstated as the exterior is, the interior is rather appropriate, though highly futuristic. But futuristic isn’t a bad trait, especially when backed by actual technology. 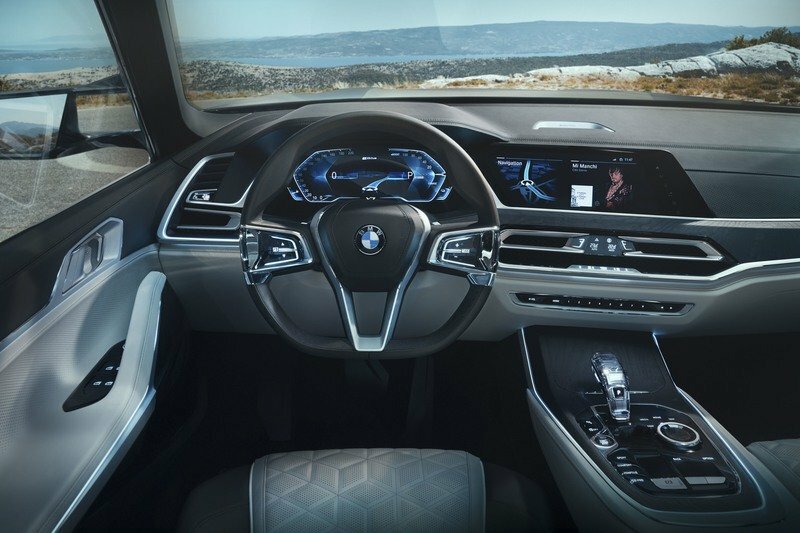 The X7 features twin, 12.3-inch displays for the driver – one for the gauge cluster and the other for the infotainment system. More screens reside in the second row, allowing those passengers to keep up with navigation, adjust seat settings, check the weather, and even listen to their own music. Adding to the techno-flare, the software allows for interworking between applications. For example, a user can send an address to the navigation system from their email accessed on the screens. BMW’s iDrive system is reworked here, too. It features a large, low-rise knob surrounded by several shortcut menu buttons that are actually touch-sensitive panels. The same type buttons are used for the drive modes, traction control, and Park Sense features. The drive modes include Sport, Comfort, Adaptive, and Eco Pro. The gearshift looks as if it’s cut from a diamond. Aside from the indented Park button, it shines brightly like it’s under a jeweler’s cabinet. Though we haven’t seen it in person, BMW seems to have done a great job with using high-end materials and fitting them together rather well. Real wood is matched with real aluminum. The leather seats feature a two-tone color scheme and diamond-shaped perforations. Nearly every panel is accented by light pipes, giving the X7 a rather scrumptious look at night. The X7 iPerformance Concept offers room for six, with the first and second-row seats placed on individual pedestals. The X7 iPerformance Concept offers room for six, with the first and second-row seats placed on individual pedestals. This should give occupants tons of legroom, along with the sense of spaciousness. 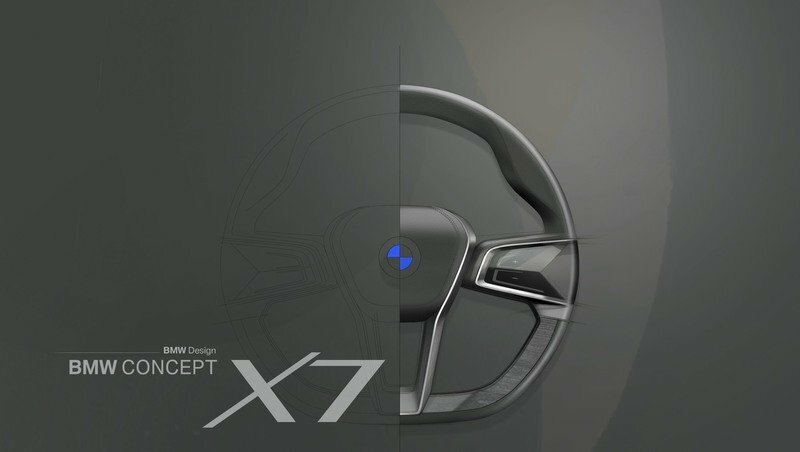 While the interior is certainly our favorite aspect of the X7 Concept, several features aren’t likely to translate to the production version. Chief among them is the glass roof with its interesting Y-shaped support. Etched within the rear glass panel is backlit crystal glass that illuminates at night. As mentioned, BMW hasn’t revealed exactly what powertrain is under the X7 iPerformance Concept’s hood. Nevertheless, BMW gave away most of the details. 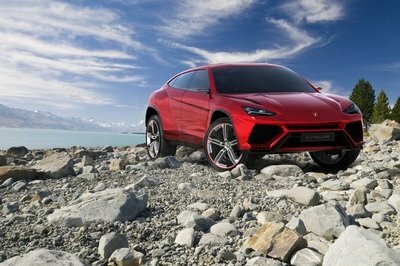 The SUV uses a gasoline engine with TwinPower (meaning a single, twin-scroll turbo) lturbocharging for its main power source. It’s then mated with an eDrive system that offers fully electric driving and plug-in recharging. Beyond that, everything is speculation. BMW will likely use its eDrive system borrowed from the X5 and 3 Series. In the case of the X5, this means a 2.0-liter turbocharged four-cylinder with 241 horsepower paired with a 111-horsepower electric motor for a combined output of 309 horsepower. An eight-speed automatic transmission sends power to all four wheels. The X5 eDrive is capable of 19 miles of all-electric driving. 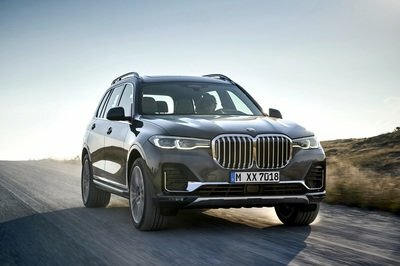 Expect the 2019 BMW X7 to match or surpass those numbers. The hybrid powertrain won’t be the only X7’s power source. BMW will surely utilize its 3.0-liter TwinPower inline-six and 4.4-liter TwinPower V-8. Both gasoline engines should move the X7 with authority, but the V-8 and its 445 horsepower and 480 pound-feet of torque is the driver’s choice. BMW is likely to include a diesel option, too. In the X5 35d, a 3.0-liter inline-six is used with 255 horses and 413 pound-feet of torque. The BMW X7 iPerformance Concept shows a very interesting future for BMW. While we’re not big fans of the overstated exterior, the well-done interior and high level of user technology is a welcomed improvement over current vehicles. The fit and finish within the cabin appear to be top-notch and the large screens give the driver plenty of information in a modern yet simplistic manner. Add to that the fuel-sipping eDrive powertrain, and the X7 iPerformance shows huge promises. It’s been a long time coming for BMW to finally bring a three-row SUV to market, especially considering how many different versions of the 3, 4, and 5 Series sedans it has. The X7 iPerformance Concept will be on display at the 2017 Frankfurt Auto Show. 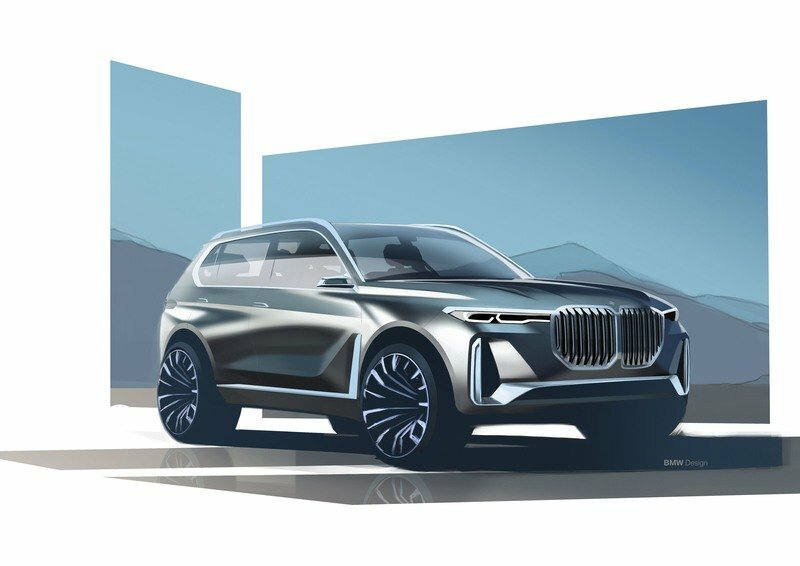 BMW will likely wait until early in 2018 to debut the production version of its X7, with examples arriving in showrooms later that year as 2019 models. Tell us what you think of the BMW X7 iPerformance Concept. Do you like the interior as much as we do? What about that huge grille? Let those opinions flow in the comments below. 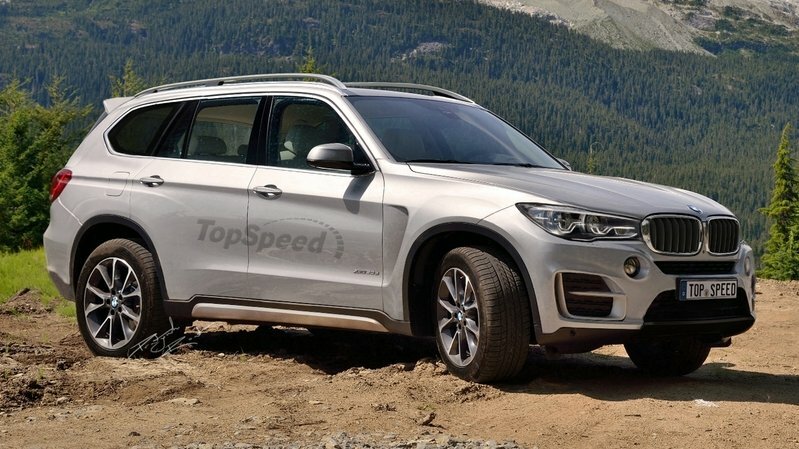 Read our full speculative review on the BMW X7. 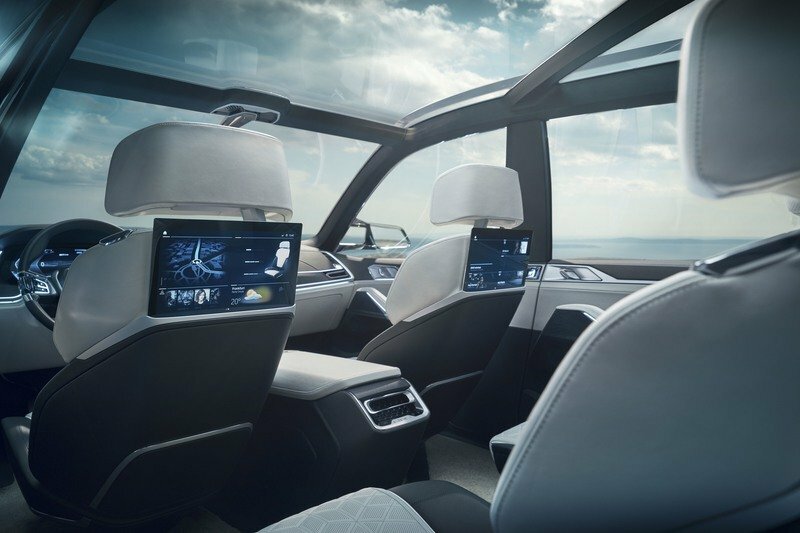 With the unveiling of the BMW Concept X7 iPerformance at the IAA Cars 2017 show in Frankfurt, the BMW Group is not only pulling back the covers on a new model concept for the luxury segment, it is also introducing a whole new take on luxury for the BMW brand. The Concept X7 iPerformance embodies this understanding of luxury in the form of a striking exterior composed of intently focused lines, and combines it with a generously-sized, six-person interior pared down to the essentials: elementary forms, high-class materials and a state-of-the-art infotainment system brimming with connectivity. The Concept’s iPerformance badge denotes the presence of groundbreaking BMW eDrive technology allied with a BMW TwinPower Turbo petrol engine to create an exceptionally efficient and dynamic plug-in hybrid powertrain that excels in all driving situations – including running with zero local emissions. 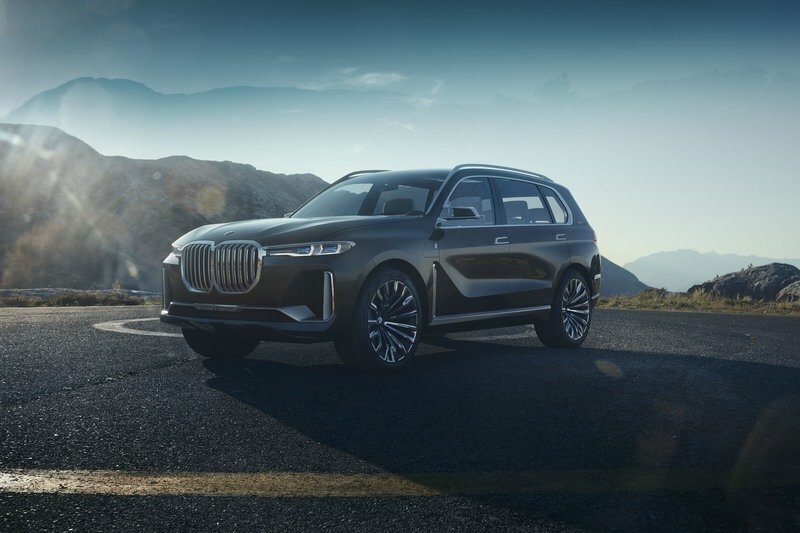 The front end of the BMW Concept X7 iPerformance is one of its most eye-catching angles, the vehicle’s height alone ensuring it rises prominently over the road. In an all-new interpretation of classical BMW elements, the front-end design groups together the various facets of the vehicle into a powerful visual statement. The large, vertical kidney grille at the heart of the upright front-end silhouette hogs the attention. The grille frame and bars are single-piece and solid in design, as if hewn from a single piece. Look at it again, though, and fascinating contrasts emerge between gleaming edges and matt surfaces, all of which breathes extra vibrancy and class into the frontal impression. A prominent bar extends across the full width of the front apron in its lower section, before rising vertically to frame the outer air intakes at their upper edge. This lends the front end additional stature. Quasi-vertical aero lips further accentuate the car’s powerfully assured stance on the road. Customary X features like the trapezoidal bumpers and underguard, meanwhile, are merely hinted at, their understated design serving the cause of clear and exclusive surfacing. Distinctive brand presence for BMW’s luxury-segment cars. As part of its forthcoming model offensive, BMW has developed a new presence for its luxury cars that sees the profile and positioning of the most exclusive members of its range refined into a distinct product category. The new BMW 8 Series, new BMW X7, BMW i8 and new BMW i8 Roadster will join the BMW 7 Series in the brand’s significantly expanded luxury segment line-up. The identity and attitude shared by BMW’s elite models are echoed in a newly designed logo which combines a black-and-white version of the manufacturer’s roundel first used 100 years ago with the company name “Bayerische Motoren Werke” written out in full. With its classical, understated aesthetic and the company’s original name spelt out, the logo highlights BMW’s inimitable history. The boldness to explore standalone solutions and concepts, and the ability to take on challenges and emerge from them stronger, are deeply-rooted elements of BMW heritage. This approach – encompassing everything from the first altitude-world-record-breaking aero engine to the launch of the BMW i brand – has proven to be a recipe for success, as well as showcasing the company’s passion, confidence and gift for bringing the future into the present day. 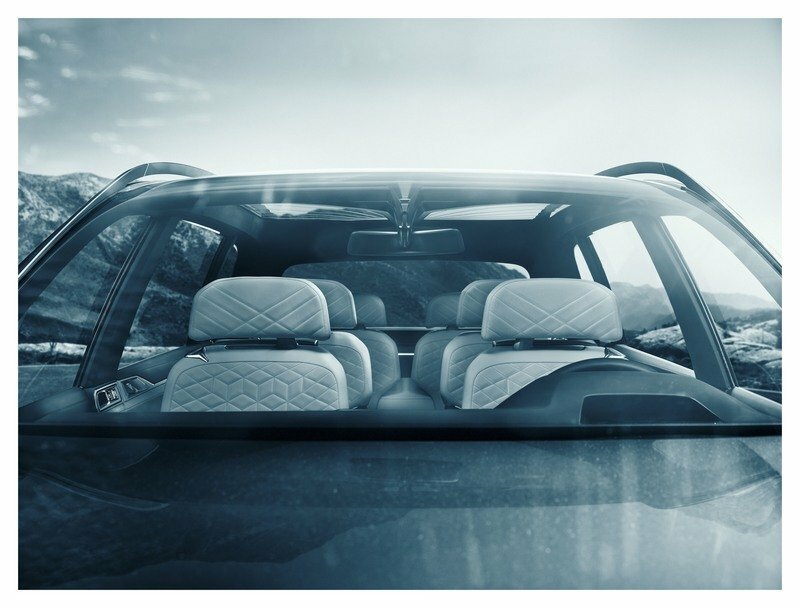 The new presence for the brand’s luxury-segment models will be unveiled for the first time at the IAA Cars 2017 show in Frankfurt on 14 – 24 September 2017.